Lombardi's is a pizzeria located at 32 Spring Street on the corner of Mott Street in the Nolita neighborhood in the borough of Manhattan, New York City. 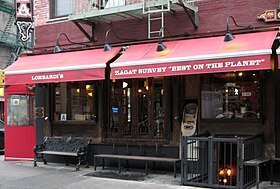 Opened in 1905, it has been recognized by the Pizza Hall of Fame as the first pizzeria in the United States. Gennaro Lombardi started the business in 1897 as a grocery store at 53½ Spring Street, and began selling tomato pies wrapped in paper and tied with a string at lunchtime to workers from the area's factories. In 1905 Lombardi received a business license to operate a pizzeria restaurant, and soon had a clientele that included Italian tenor Enrico Caruso. He later passed the business on to his son, George. In 1984, the original Lombardi's closed, but reopened 10 years later a block away at 32 Spring Street, run by Gennaro Lombardi III, Gennaro Lombardi's grandson, and his childhood friend John Brescio. This change in location and this hiatus surrendered the title of America's oldest continuously operating pizzeria to Papa's Tomato Pies in Trenton, New Jersey, which opened in 1912 and has sold pies without interruption since. The relocated, reopened Lombardi's uses a coal oven to bake its pies the way the original did. It is unusual in not selling slices, highly popular throughout New York City. Only whole pies made to order are sold. In 2005, Lombardi's offered entire pizzas for 5 cents, their 1905 price, to commemorate the 100th anniversary of the first pizza sold at its original location. In 2019, suspicion was raised whether Gennaro Lombardi was the true founder, after a search of his birth record, naturalization papers, and other supporting documents show he first came to America in November 1904 at age 17, classified as a “laborer”. If he became involved with the pizzeria at 53 1/2 Spring Street in 1905, it was as an employee not as an owner. Research suggests Filippo Milone opened the pizzeria. ^ Fox, Nick (July 27, 2011). "Trenton Pizzeria Stakes Claim to Being the Nation's Oldest". The New York Times. Wikimedia Commons has media related to Lombardi's Pizza. This page was last edited on 10 February 2019, at 17:01 (UTC).